RDRtec was founded in 2006 for the purpose of performing basic and applied scientific research, and providing science and engineering consulting to Government agencies and private industry. Dr. Theis has extensive experience in active element phased array radar systems, mode and waveform design, simulation and system design. Current focus areas include radar architectures, algorithm development, and performance studies. 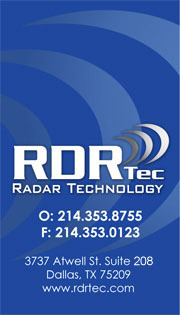 He has over 30 years of experience in radar systems engineering. Mr. Norvell has extensive experience in radar system electronic scanned arrays, solid state transmitters, digital signal processing, GaAs microwave components, antennas, IFF, missile systems design; guidance and control, RF and EO seekers, fuzing, ECCM, targeting, RF and sensor MEMS including inertial and microwave. He has over 40 yrs experience. numerous US DOD funded radar design and development efforts. He brings with him the expertise and software that has developed commercial software packages for antenna/radar system design and simulation. Those products include RAST, PAAS, and IRSS which are widely used by industry, government agencies, and universities. Mr. Hancock is the lead engineer on the AFRL sponsored RLSTAP simulation tool development effort. Mr. Hancock has participated in numerous Space-Based Radar design and evaluation efforts funded by DARPA, AFRL/Rome, and Grumman/Bethpage from 1977 thru 1986 and more recently for the Space Radar Integrated Program Office. Michael Matuson is RDRTec lead for software process, simulation architecture design, and software design. He began his career at the Applied Research Laboratory at the Pennsylvania State University as a Research Assistant working in the field of underwater signal propagation and signal design where he developed advanced signal processing algorithms for use in sonar imaging. At Texas Instruments Defense Systems, where he spent 15 years, he was an advance sensor simulation design expert. He was involved in modeling passive RF sensors that included interferometer angle estimation, radar sensors and imaging infrared sensors as well as developing high fidelity simulations for a wide variety of purposes. He developed imaging processing algorithms for fire-and-forget technology missiles and autonomous target recognition algorithms for missile and other airborne platforms. In 1999, he became an independent contractor for designing simulations for real time visual fidelity and high fidelity radar models. He joined RDRTec in 2006. Mr. McKay has extensive experience in software development and computer systems administration. He was the lead programmer in developing the RAST-K and RLSTAP simulation tools, which are widely used in the defense industry. He is responsible for simulation tool maintenance and upgrades, configuration management, acceptance testing, documentation, delivery preparation, and customer support.